This past Tuesday, March 8th, marked International Women’s Day, a day to recognize and pay tribute to the struggles of women everywhere. At Critical Resistance, we seek to honor the often overlooked legacies of resilience, resistance, and power that women, trans, and gender non-conforming people have contributed to movements for a liberated future. 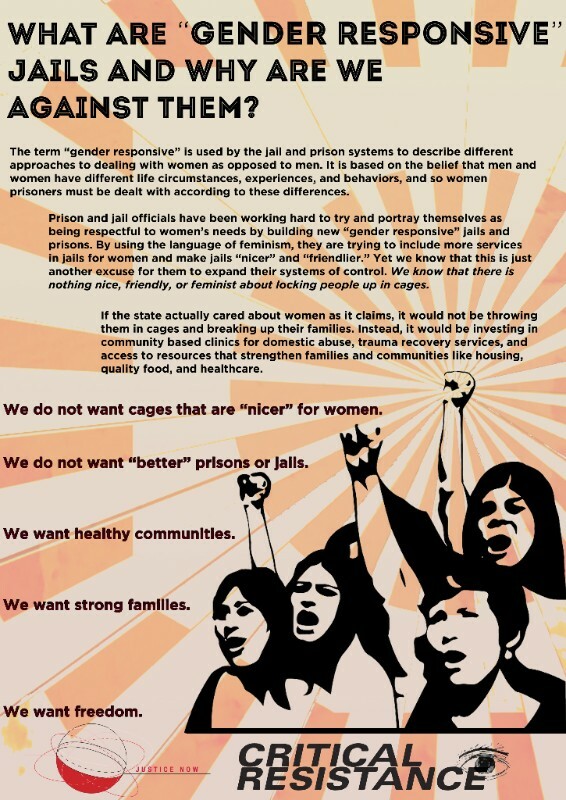 We also seek to strengthen the fight against the prison industrial complex on all fronts, among those being the particular ways in which women, trans, and gender non-conforming people are targeted, criminalized, and repressed. For instance, CR Los Angeles is actively involved in a fight against a women’s jail in LA County. To the outrage of grassroots women’s networks and community-based organizations, the LA County Board of Supervisors is trying to pass off this new women’s jail as ‘gender responsive’ rather than the environmental and human tragedy that it would be. The state is justifying building more cages under the guise that the cages need to be more caring to women. However, because of steadfast organizing and resistance, the county has been trying to build different iterations of this jail for years, to no avail. And we will continue to fight until the women’s jail is defeated definitively. In honor of International Women’s Day and during this Women’s History Month, we ask all to continue organizing against women’s cages, against all cages, and to amplify and support the self-determination of women, transgender, and gender non-conforming people. We know that the prison industrial complex feeds off and fuels the oppression of women, and any movement that seeks to abolish it must centralize an end to gender based oppression, and follow in the path that powerful women leaders have laid out before us.